Calling customers and handling customer interactions over the phone can be frustrating sometimes; they may be upset, rude, or outright mean on any given day. If you’re frustrated by managing customer phone calls, there might be a few steps you can take to make it easier on yourself while also improving your customer service. Follow these tips for keeping your customers happy on the phone with you to reduce your phone-related stress at work. Avoid heavy scripting: While having a set script might seem like a good way to reduce stress, it might actually increase the number of phone-related issues on the job. Heavily scripted calls may not be the best approach; they can eliminate two elements essential to the customer service experience: empathy and emotion. When customers recognize that they’re being led through a script, they can get frustrated, as they don’t feel like they’re getting personalized customer service. Try to steer away from heavy scripting when possible. Try to keep people off hold: Nobody likes to be left waiting on hold for a long time. Customers who have been left on hold for a long time are likely to be more irritable. Make sure your telephone answering services are as streamlined as possible, so no one customer is left on hold for an excessive length of time. 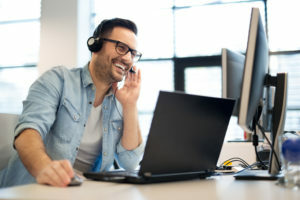 Be available when your customers are: Customers typically want to avoid having to call back, so having after hours phone services can help prevent issues created by customers calling multiple times for one issue. Using a 24 hour message center can ensure your customers are able to handle their issues with just one call, improving efficiency for you and reducing the number of customers frustrated with your company. Additionally, 24 hour message centers allow all customers to call when it’s convenient for them, creating a better customer service experience overall. Looking to improve your customer service and keep customers in a better mood when they’re on the phone? A Better Answer provides a wide variety of phone answering services for your business to help you run your company as smoothly as possible. Contact A Better Answer today for more information on what services may be best for your business.